Enhance the look of your dining room or eat-in kitchen with the sophisticated yet casual style of the Sofie dining collection. A five-piece dining set takes front and center in this versatile collection, which consists of four upholstered seat stools and a uniquely designed counter height table with marble look top. The counter height table's square shape makes it an exceptional fit for nearly any space, from compact kitchens to generously proportioned dining rooms. 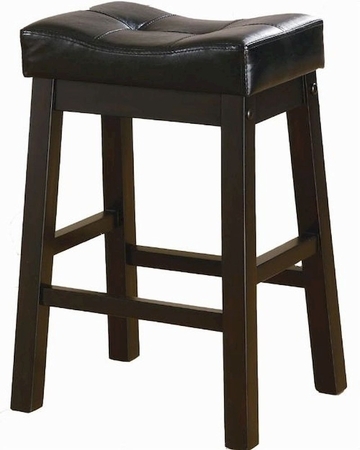 Four backless stools feature ultra plush seats upholstered in luxurious black that resembles the high end look of leather. Tufted button accents add texture to the seats, while sturdy post legs anchor the square table and all four stools. The richness of the table's faux marble top makes a stunning contrast with the warm brown cherry finish that wraps the base of the table and stools. The upholstered stools are available separately in your choice of 24" or 29" heights for seriously stylish dining that fits any space.